R/C Blogs RS2K's blog Discussion RaceFlight - Next Generation Performance and Ease of Use. This thread is privately moderated by RS2K, who may elect to delete unwanted replies. RaceFlight - Next Generation Performance and Ease of Use. 1. RaceFlight firmware. We are currently very actively developing RaceFlight One firmware. This is new firmware from the ground up and has been in works since December of 2015. The goal with the new firmware is to focus on ease of use and performance without having to deal with the vestigial limitations inherent with multiwii based code. 2. ESC firmware. The reason I started RaceFlight was to test ESC theories. The final product of those theories was the MultiShot protocol. RaceFlight is designed to run at very high frequencies. 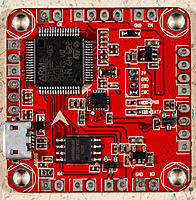 It is highly recomend you use ESCs capable of accepting at least a 32 KHz RC input. 3. Quality Hardware. While it's been proven RaceFlight can handle just about any setup out there, you will get best results when using quality hardware. Electrical noise on poorly designed or damaged Flight Controls will affect flight quality. Poorly designed or noisy ESCs/PDBs could also affect flight quality. RaceFlight is capable of compensating for poor equipment, but you'll always get best results with properly functioning hardware. 4. Other equipment. In the interest of giving people the best recomendations, we have started branching out from firmware alone. Our first step is the new RaceFlight Orca. This is a new frame the Raceflight team partnered with Andy Shen of Shen Drones with. This is the frame the RaceFlight Race team flys. It's increadibly tough, increadibly stable, and shockingly fast. We also have a recomended setup with a perfect PID tune for anyone interested. Last edited by RS2K; Nov 04, 2016 at 08:07 PM. This is fantastic news RS2K, the OpenPilot/LibrePilot/OPNG team is lucky to have you. I'll put more information in here as it comes along. There's a huge potential here with the STM32F4 processor running on betaflight. I hope to unlock some of that potential in the next few months. I have several goals for this project which I will announce over time. Right now the port is only working on the Revo, but the firmware seems very stable and it flies incredibly well. In the interest in furthering the hobby and giving fellow hobbyists more options for their OpenPilot / OPNG / LibrePilot hardware, I've been spending the last couple of weeks porting betaflight onto the the Revo and Revo Nano. I had to do some research to make this happen. I was fortunately enough to see most of the F4 porting work had been done by GitHub user Sambas here: https://github.com/sambas/cleanflight. Using that as a reference, I created a new branch of BorisB's BetaFlight which allows the Revo F4 target. I will release the source and binaries when I'm a bit more comfortable with the code and I'm sure it's safe and ready for others to fly. Sweet man! I've got a PX4 mini sitting on my bench right now. If you want to port that too I'll do some testing for you. Nice, are you going to add OpenLRS support for the Revo as well? Big thanks to RS2K for his work on this!! There are a small group of people/projects single handedly moving this hobby along and this project (RS2K) is definitely apart of it. I have a Revo Nano that i can't wait to try this out on!! Does the faster processor allow for even faster loop times?? Anything's possible, but I have other plans before trying to do something like that. I was talking to someone about that earlier today. I've definitely thought about it. I can't use 433 in my area because of the high noise floor so I'd want to get a 915 radio working before making that happen. I saw around 220 with the revo. My plan is to lock betaflight at 500 to begin with then move to 250 if I can make it work. It's goiong to require changing how betaflight currently works. I'd like to make some optimizations to the code first. The 168 MHz CPU and tons of RAM on the Revo should allow for some really cool stuff. Yeah OpenLRS doesn't care which module is used, they're both compatible. Kha is super helpful too. He'll definitely have some good input on how to accomplish it. I saw around 220 with the revo. My plan is to lock betaflight at 500 to begin with then move to 250 if I can make it work. I'd like to make some optimizations to the code first. The 168 MHz CPU should allow for some cool stuff. nice! Is there a differences between the Revo and the Revo nano in terms of achievable looptime... gyro update speed and so on that would make one better suited then the other? See now I'm going to have to go buy one! I've been very busy with work. Lately I've been busy with Cleanflight and Betaflight. One of these days I plan to do that. I expect a similar flight experience out of the nano and revo nano. The Revo has a faster CPU but the nano has a better gyro. I have a hunch the faster CPU might win but we won't know for a few weeks.